Of course giving to my my personal mission fund is very much appreciated. We are in the processing of purchasing land for our church (FINALLY). We need to raise $30,000 in the next five months to purchase it. Right now until December 17th-- Free Shipping on orders more than 39 dollars! "Christmas at Camino" Every year Camino (formally CAM International) puts out a wish list in which you can give money towards different ministries around the world. Check them out... all great projects.... there is even an Ixtapaluca Project! This week (and next) we are wrapping up all the fall programs at the community center.... so we have been busy getting everything together for that night! I was going to write everything that is going to be happening in the next week and a half... but Rod beat me to it... so go check it out! I am thankful for many many things in my life. I am so grateful that God has given me the life I have... I am grateful for the friends, the supporters, the family that he gave me. I am thankful for all of my experiences and even all of the challenges! here is a view from our hotel room! * Skype... so i can keep in touch with people. * A wonderful community of people. 1. days at home alone. I love hanging out with people, I love getting to know people and doing things all the time.. but every once in a while I just need some time alone. Its also good for catching up on things! 2. waking up in the morning without an alarm clock curled up with warm blankets and my puppy! 3. Thunderstorms. I wish we had one right now! Wheelchairs, evanglism, earthquake, church property, the beach! 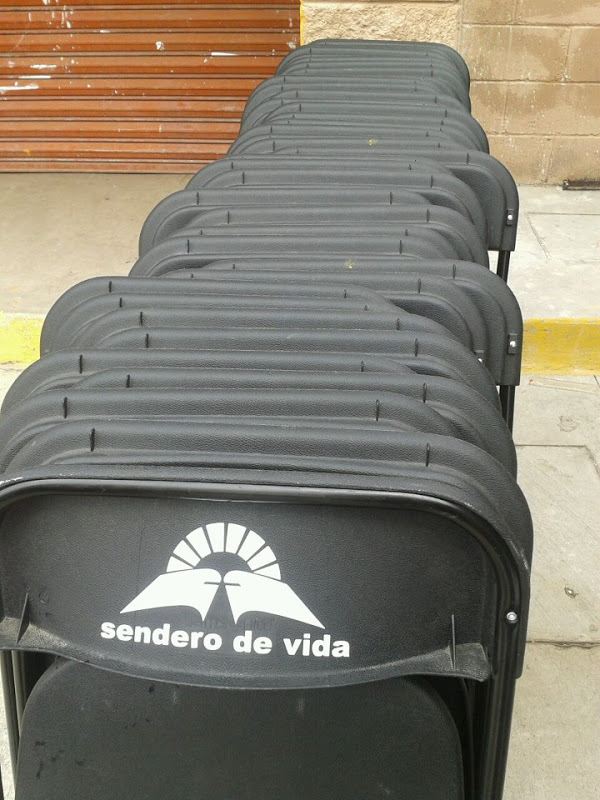 Rod, Ismael, Marta, and I went to pick up another 25 wheelchairs to give out! If you haven't heard about this ministry that I happened to kinda stumble upon a few months ago--- It is called Operation Blessing. Basically we are getting wheelchairs from them for about 12 dollars a piece, which has been primarily donated by friends we know from the States. To date we have already been able to have 2 events giving wheelchairs out (I am not sure of the exact number but i want to say between 35-40). It has given us a way to minister to new people and reach a group that is typically left out. We have also been able to get into the special ed school that is right here in our neighborhood! December 7th, will be our 3rd (and hopefully not our last) event will wheelchairs. In combination with that is also the closing event for our community center, and an evangelistic outreach with our neighborhood. We hope to have lots of new people come for the event. Please be praying for that! Last night Mexico experienced a 6.1 earthquake. I believe it was around 3am. I probably would have slept right through it if my dog wasn't freaking out. After she woke me it only lasted a few more seconds... but she didn't settle down for about an hour after that! Everything i read reported no major damage, thank God! Please continue praying for our land situation. We have some land we are looking at. Please pray for wisdom of people handling the decisions and transactions! 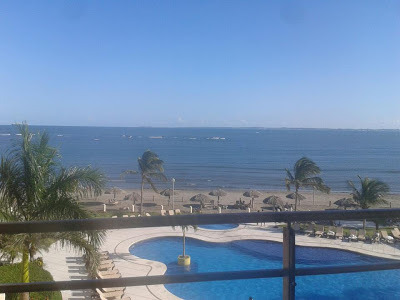 And finally... we are all looking forward to leaving the craziness behind for a few days to have a team retreat on the beaches of Veracruz from Monday-Thursday next week! This is what 25 un-assembled wheelchairs looks like... who wants to come help up put everything together? * Creativity- I love being creative, sometimes i even crave it! * The opportunity I have had to meet people all over the world. * The opportunity to be educated! P.S. Here is a great blog by my friend Chris! * Sleep! And the nights where I sleep so hard and wake up rested! * Working Out-- even though everyday I hate it- I know it is good for me! 2. For my visa... and that I can stay in Mexico all year! 3. For the sunset and how beautiful it is on the volcanoes! One thing is for sure... we will need money to buy the land... and then money and people to build the building! This summer bringing a group down to help with construction! We would love to see you, I believe it is going to be a CRAZY summer... so you WILL want to be apart of it! 1. Seasons. Not just in nature (which I LOVE) but also in life. 2. Water. Even though I do not currently have running water in my house, I normally have an abundance of clean water (although i do buy drinking water here). Millions of people don't have this luxury! 3. Freedom of Religion. Both in the USA and the ability to speak openly about Christianity in Mexico. I know of MANY missionaries who have to tip toe around... I pray for them daily! A video about Mexico... from prayercast.com. I was looking at operationworld.com and came across it. * Tomorrow (Thurs) Rod is going to be meeting with some people about some land that we would LOVE to purchase for our church building. Read about it here! * Please be praying for the youth girl s bible study. It is a great study for the girls but getting them to come and come on a regular basis is tough. We typically have 2-3 come but they aren't always the same 2-3! Our desire is for them to (obviously) grow in the Lord and have great discussions during that time! * The community center... that we can figure out a way for it to be self sustaining... and someone to take it over. *As always we can use prayer for safety and protection... for the leaders of our church here in Jesus Maria,and the ministries happening here! Every year CAM (now Camino) puts out its very own christmas list. It is things needed for the various ministries all over the world! Want to give a gift that lasts? Think about giving someone a charitable gift... like money for kids programs, or a specific amount to help a church in honduras build a building! 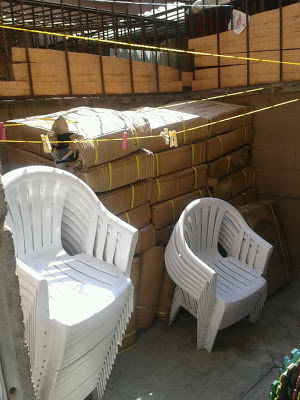 There is an Ixtapaluca Project... kids ministry in Mexico! 1. His will. That is greater and bigger then anything we can fathom! 2. The sunshine. We haven't seen it for a few days before today. Its so shiny and beautiful. It it always warms things up nicely and makes days better! 3. My health. I get sick sometimes, but so far i have been more than blessed to be healthy! I went around and took a few pictures in my neighborhood today for a project I am working on. I love projects, and with any luck this one will be pretty cool! But here are a couple pics of around where I live in case your curious! 1. Being an American. I am thankful I am a citizen of a country where I can vote. I love my country (even though i don't currently live there!). 2. Jesus. I am thankful my hope is in the LORD not in the man or the outcome of the election today! 3. Driving. I miss it being here in Mexico--- but i LOVE driving when I go back to Nebraska! 4. Joy. Being joyful for what you have... for what Jesus has done for us. Joy is a choice. Yesterday we had a great service at church... once a month we do an adoration service. People can sing a song, give a testimony, pray, or worship however they wish. The guys did a song. So did some individuals and even a family. It is great that everyone can have an active part in our worship service. Then we shared the Lords Supper together! 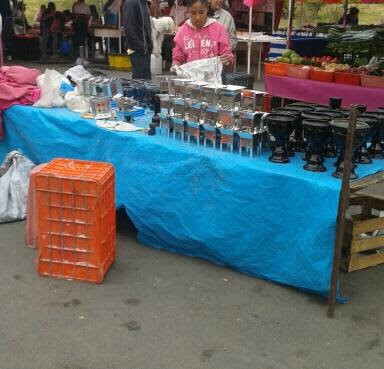 Today Tiff and I went all the way to the other side of Mexico City in hopes of getting visas. We knew that tiffs was ready, not so sure if mine would be. We left empty handed. But did manage drinking some tasty coffee and found PB m&m's in the metro station. Guess we will try again next week! I am sitting in my house freezing right now (winter is apparently here). I am looking forward to our missionary team meeting on the beach in two weeks! Rumor has it they have a hot tub.... and a beach... what could be better! Now back to gearing up for another week of community center activities and reading the stuff for tomorrows youth girls bible study! 1. Change. It scares me sometimes but without it i would not be where I am today... and I would not be the person i am today either! 2. Paw Prints. I can not help but smile a little when i see them. 1. Blankets. I love when it is chilly and I can wrap up in a warm blanket! i love being under a pile of blankets, curled up and warm (and waking up without an alarm). Best feeling! 2. Encouragement. For those people who are a constant encouragement in my life...and for those moments when God allows me to be an encouragement to others. Today we were suppose to have a youth service project. No one showed. We should count our blessings because usually we have so many youth come we don't have enough jobs for them.. But that left Fabian, Tiffany and I (Chela and Carmen started helping too) to put the Church Logo on the chairs. It wasn't as easy as we anticipated. We got 44 out of about 120 done today. More work to be done later! But i do like them! 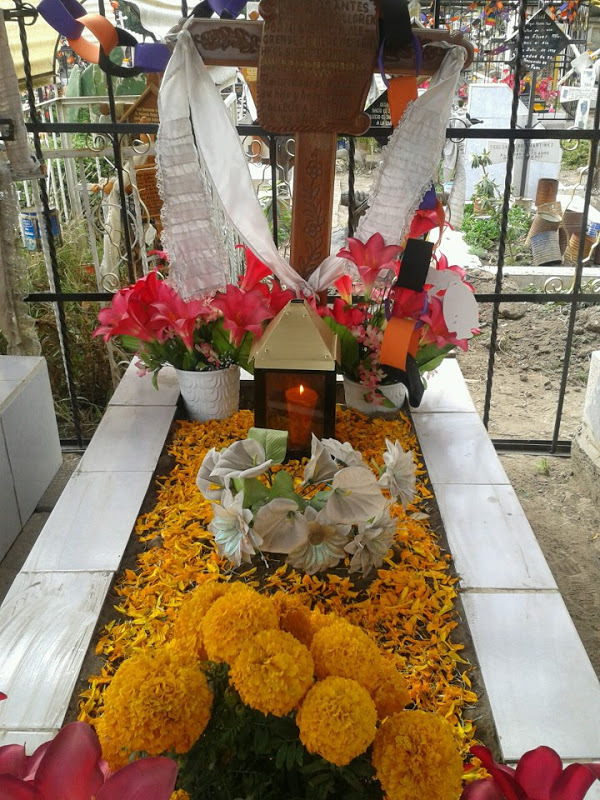 Before I start-- Rod wrote a great blog about Day of the dead. Check it out. After we left we decided to head down to the Zocolo (center of mexico city). 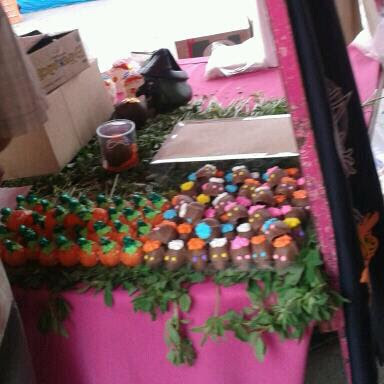 What we didn't think of .. its day of the dead... hahaha. We had a little shocker when we turned down the street to see probably over a million people jammed into this little street (well, its not a little street its pretty wide!) TONS of people dressed up in day of the dead/Halloween costumes. When i think of Halloween at home i think... little kids dressing up as puppies, super heroes, princesses etc... or older people dressing up in the most creative costumes then can think of for some party. But here.... wow. Everyone is dressed up in the scariest costume they can possible find or make. Adults and kids alike. I think the goal is to look as dead as possible. 1. Crazy adventures and the ability to live life to the fullest. I don't think I ALWAYS do a great job of this but i love when i do-- and i love the people I get to do it with! 3. For the internet. THe ability to have all the knowledge just a click or two away. The idea that i can network and chat with anyone in the world instantly... that should blow us away! * My Beloved Dog: Always there to greet me and even hug me when I come through the door, Maggie gives me so much love. I know she won't be with me forever, but I cherish the time we've spent together and the time we still have. There's nothing like the unconditional love of a dog. * Living in Mexico: It has been a life changing experience for me. I have learned so much, and I bet I will continue to learn even more here as i go though this journey God has placed me on. I am grateful for the friendships I have acquired since being here... I am thankful for everything that God has done in me since being here... I am grateful for new experiences. * The moon and the stars. I love nothing more then laying under them! Sometimes we can even see them from here! 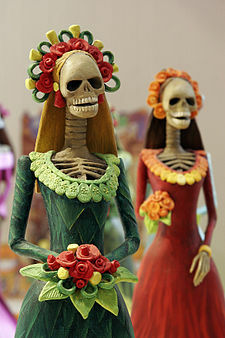 Day of the Dead-- one of the biggest "holidays" in Mexico! Happens between what we know of as Halloween and November 2. The day when the people who have passed away, people you love, return-- or at least their spirits apparently do. 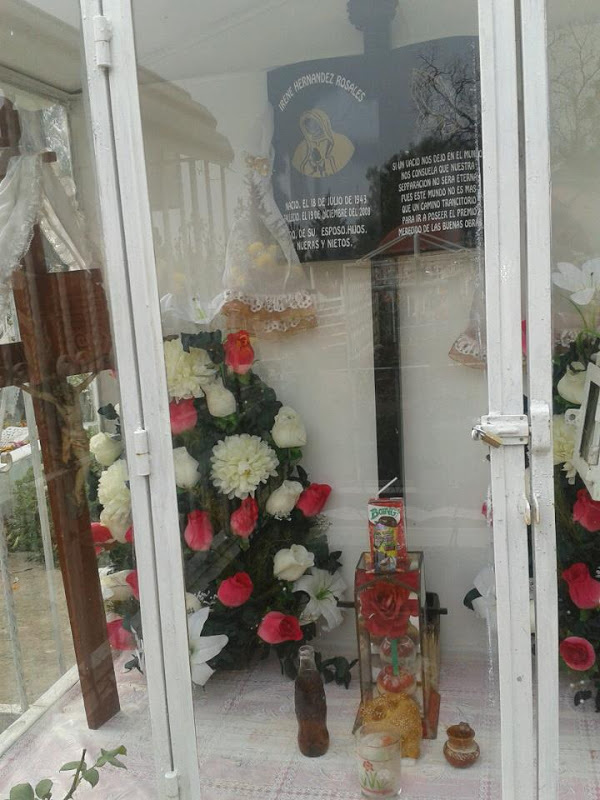 A lot of Mexican families set up an alter to their dead relatives. On it you will see flowers... particularly Marigolds (which someone told me is suppose to help bring back the dead), different typical foods (the foods their deceased family members enjoy), water, alcohol, candles, skulls, and some pictures of the family members that are expected to come back. All of this --- of course--- is accompanied by a big party. At home October 31- Halloween is a secular holiday with lots of parties, cute costumes and too much candy. But here these few days are very tied to the Mexican culture with many idols being worshiped (i think this happens more in some parts of Mexico more than others)... they even get a day off! I read on Jims blog from a few years ago that the Catholic church came out with this statement... "those who celebrate Halloween are worshiping a culture of death that is the product of a mix of pagan customs. The worst thing is that this celebration has been identified with neo-pagans, Satanism and occult worship." Anyways, I didn't totally get all of the ideas around this, so this year I decided to ask 4-5 families from our church what they thought. A lot of them come from families who do this yearly, and a lot of their extended families still do! They just told me they believed it was very sad. They seperate themselves with even halloween (which is a little more like trick or treating and candy etc) because they don't want to be a part of even that. They know that their dead family members aren't coming back to eat the food. I asked one... "if the food is still on the alter, then how do you know it has been eaten". 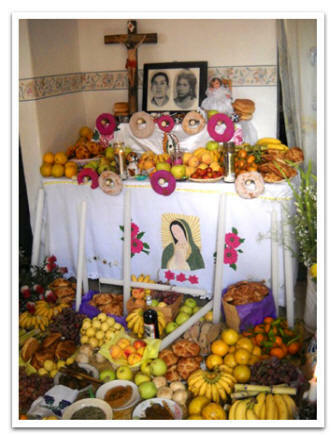 She said that people have tried the food that has been sitting on the alter after the day and it has no taste and the glasses of water have less water. She told me ... its science... leave a glass of water out for a few days, and there will be less water in it! 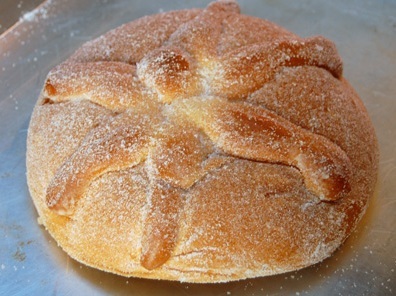 As Tiffany and I walked around the neighborhood with our doggies today you could see the offering tables in peoples houses, and all the people selling incense, candles, flowers and pan de muertos (bread of the dead). We also decided to visit the cemetery... we knew what happened in the houses. It was interesting. The flowers on sale for the graves and offerings. Throughout the month I want to post things I am thankful for. I can't promise it will be every single day. But, over the past few weeks I have been convicted to think about all of the things in my life that i am blessed to have. All of the wonderful things that God has allowed me to have, or experience. * My friends. I have friends all over the world. They are all vastly different from each other and have been there through different seasons of my life. But, I feel extremely fortunate to know that I have those people who will always be a positive part of my life, even if a lot of them i don't see often (because of distance especially). * Laughter. I love laughing. Keep checking back for even more things I am thankful for! 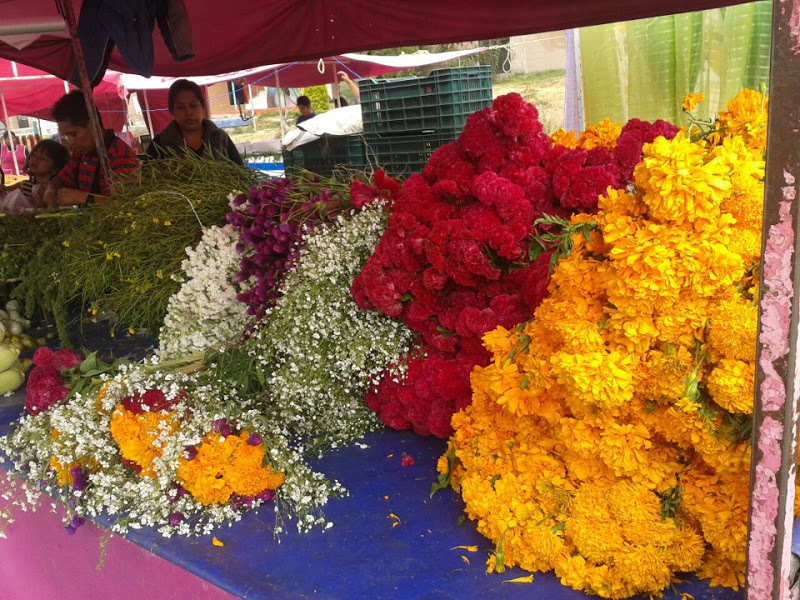 Beautiful flowers that are used on the offering tables for the Day of the Dead celebrations that started today.